Tim Holtz Rubber Stamp PEACE ON EARTH Stampers Anonymous E4-2156 at Simon Says STAMP! E4-2156 / 0.8 This item is on reserve until If you would like to reserve this item now, you may purchase it now with the rest of your order. We will hold your order now and ship your entire order as soon as this item is back into stock. If you would like your order to ship now, please place this item on a separate order. Success, Tim Holtz Rubber Stamp PEACE ON EARTH Stampers Anonymous E4-2156 has been shared! 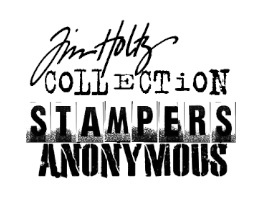 New sentiment stamps from Tim Holtz 2013! Stamp them on photos, cards, tags, or alone. You can even stamp it perfectly inside the sayings frame for a perfect accent. Even better, these sayings are also sized to fit the larger banners on the Tim Holtz Tattered Banner die from Sizzix. This stamp has contoured easy grip sides, a quality heavy weight wood mount, and thick foam with deeply etched rubber.. Neatly trimmed and already wood mounted for your immediate stamping pleasure! Words are all approximately 2/8 of an inch tall.